'It may be of interest to archaeologists generally to state that the stone man of West Bridgford has been rescued from the field where it has been exposed for so many years, and has at last found a permanent and appropriate resting-place on a stone slab close to the chancel door of BridgfordChurch. The removal has been effected by one of the churchwardens of the parish, Mr. W.H. Simons, who obtained permission from the owners of the land, Messrs. Wright and Hurcomb, thus saving an ancient monolith from the fate which was feared might result in the course of building operations. The position the effigy now occupies is not, perhaps, altogether consistent with the traditions connected with the ancient relic; but it is at all events a respectable compromise in relation to the opinions expressed, and it is now safe from further defacement by tourists and others who take a delight in carving their initials on objects of interest. 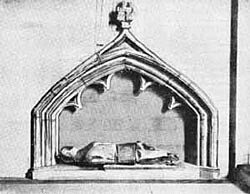 The stone man is popularly supposed to be the recumbent figure of a knight in armour forming the lid of a stone coffin, in which his remains were interred. The theory expressed, that it formerly occupied the empty space in the canopied tomb in WestBridgfordChurch, is declared on ecclesiastical authority to be an erroneous one. An ode to the stone man appeared in a volume of “Poems by Edward Hind,” published in 1853. The ode alluded to [“Ode to the Stone Man of West Bridgford,” in forty-two lines. – ED.] is speculative as to where the stone man came from before it got into a pond at Bridgford, where it remained for fifty years. I am sorry to upset the prevalent idea that it formed part of a Crusader’s tomb. All the recumbent memorials I have seen of the heroes of that period are in marble, the carving being more or less elaborate, according to the means of the survivors. They all bear a family resemblance, like the tombstones in some churchyards. This figure, however, is in sandstone, and is identical in pattern, so far as it can be distinguished, with the carved stone figures of Roman centurions occasionally found in old Roman stations. The drapery of the figure is suggestive of the toga, and the fracture at the feet indicates where was once the tablet which invariably forms part of the monument, and on which is recorded the name of the emperor he served under. It is not at all unlikely that this tablet may be discovered in the course of excavations in the field preparatory to building operations being commenced'. 'The "Stone Man" of West Bridgford is a timely reminder of the antiquity of West Bridgford , a fact which the manifold modern amenities of that pleasant suburb tend to make us forget. The very dedication of the church to St. Giles, the patron of beggars and outcasts, helps us to realise that West Bridgford is, in spite of all, by no means entirely modern. The earliest knowledge that we have of this monument is that about the time of the battle of Waterloo it was standing upright near the junction of the Melton and Loughborough roads and was used as a manorial boundary. Its armour and other indications, however, show it to be far older than that, and it dates, in fact, from the reign of Edward I., so that this battered effigy gives to these who have eyes to see a true indication of the panoply of the soldiers who fought against William Wallace, and who helped The Hammer of the Scots to subdue that high spirited nation. Once, glowing with colour, it no doubt occupied an honoured place in the village church of West Bridgford , and it is impossible to say how and when it was debased to the utilitarian purposes of a manorial boundary. Mercifully, it has been restored to its consecrated home, and lies serenely under a carefully restored and preserved Fourteenth Century arch—dating from the time of the Battle of Crecy—in the morning chapel of the modernised church of West Bridgford . The late Mr. Harry Gill was at great pains to discover who the Stone Man represented, and concluded that it is a portrait of Sir Robert Luteril, who in 1315 or thereabouts was lord of the manor'. This page was added by Ruth Petersen on 07/09/2011. I don't suppose anyone knows where Hind is buried?